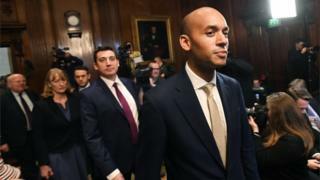 Former Labour MP Chuka Umunna has been named as the spokesman for the new Independent Group of MPs. The Streatham MP is one of eight former Labour members to join the breakaway group, alongside three Conservatives. Ex-Conservative MP Sarah Wollaston has been assigned responsibility for “new colleagues”. Mr Umunna said the group would “draw on all the talents and experiences of our group” but as it was not a political party, it would not have a leader. The group says it aims to “change politics” and offer voters “a proper alternative to the broken politics being offered by the main political parties”. Mr Umunna said: “The roles and responsibilities we have assigned recognise that all the members of our group have the right to be heard and a responsibility to provide leadership. The group is now joint fourth-largest with the Lib Dems in Parliament. Among its members’ reasons for leaving their parties were the government’s handling of Brexit and Labour’s Brexit stance – as well as the Labour leadership’s handling of anti-Semitism.